This is excepted from the Guardian article below which expands nicely upon the point made in my post Whose Tweet Counts Anyways? A response to Malcolm Gladwell. My point in that blog was that the world-wide web is … well … world wide, and not just in the developed or western world, where Gladwell’s rant against armchair, social-media activists seems to be aimed. Many of the “revolutions” that social media has been attributed to have been undertaken by people who just recently have had mass access to platforms such as twitter and facebook through cell phones. These people have used these platforms to drive movements that are no less important and in some cases successful as the civil rights movement in the US. The article below challenges some of the issues Gladwell brings up, such as why the tweets out of Iran were done in English, not Farsi (so as to engage the global media and raise awareness); or how the uprising of young people in Kashmir is now being picked up by the mainstream media. Neither of these and many other events would have reached a global audience pre-social media. And, as I have mentioned in my other posts, twitter and new spatial technologies are driving web-based platforms such as Usahidi which has become one of the key tools used in disaster relief in places such as Haiti, and transparency in governance such as in the constitutional referendum in Kenya. So, sorry Malcolm Gladwell, the revolution may well be tweeted. So says me and the Guardian. Read on. For a man who has devoted a significant part of his life to documenting “how little things can make a big difference”, Malcolm Gladwell is surprisingly dismissive of the power of social networking to effect change. In the latest issue of the New Yorker, he writes that the role played by Facebook and Twitter in recent protests and revolutions has been greatly exaggerated. Gladwell is right to be sceptical of social media’s rah-rah brigade. Before the famous “Facebook revolution”, Iran was regularly said to be in the middle of a blogging revolution. Protests everywhere from Iceland to Egypt are attributed to the organisational abilities afforded by social networking sites. Universities across the west offer modules on new media and social conflict. The fact that a Facebook group is only an updated version of nailing your thesis to a church door is conveniently ignored as the world hails the power of technology. A more recent example is Kashmir, where this summer’s protests gained widespread media coverage both in India and internationally. 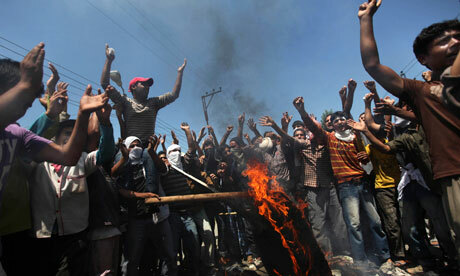 But Kashmir has been protesting for 20 years, with some of the biggest demonstrations occurring in 2008. What changed this year is that urban, middle-class India, traditionally uninterested in news from Kashmir except when we’re at war with Pakistan, was for the first time able to see and hear the other side of the story. Facebook users in India rose from 0.7 million in summer 2008, to 3 million in 2009, to 13 million today. On Twitter, it is possible to follow journalists tweeting live from Srinagar. On Facebook, it is hard to avoid mentions of Kashmir or links to articles on websites you wouldn’t otherwise have heard of. YouTube is littered with videos of protests in Kashmir. And when clips of human rights violations are taken down, Facebook is where you find new links. The mainstream press in India, like its middle-class readers, is nationalistic and unquestioning on the subject of Kashmir. Allegations of human rights abuses are rarely reported, let alone investigated. But this year, even the Times of India, purveyor of “sunshine news”, published a report claiming that for the first time, more civilians in Kashmir had been killed by the Indian state than by militants.